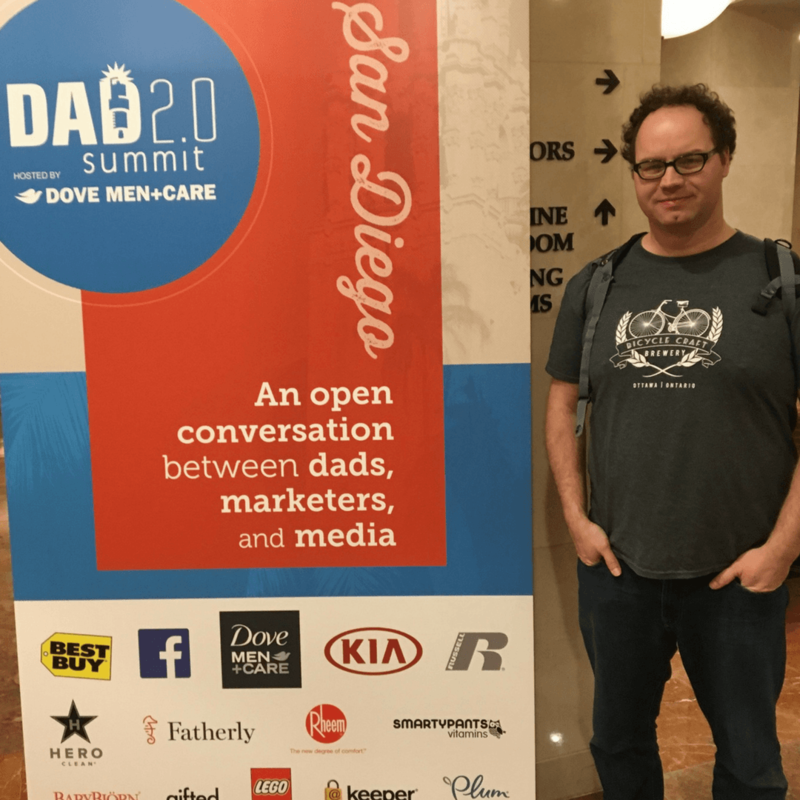 This week I was at the Dad 2.0 Summit in San Diego. It is a conference for dad influencers. We spend a few days hanging out with other dads who blog, podcast, vlog and tweet. It is an opportunity to learn from speakers and one another about how to be more effective influencers. We talk with the sponsors and take home some free stuff. Some make new contacts that will lead to paid work. In the midst of all that we’ll be chatting in the corridors and sessions, meals and over drinks about fatherhood and our lives in general. This is the sixth year of Dad 2.0 and my first year as an attendee. I went to the conference because every year for the past three years I have read blog posts from guys who have been and wished I could have been there. Also the conference is in California and I had never been before. It is February and the weather was somewhat in San Diego (and foggier) than at home. An influencer – in social media parlance is someone who has followers on social media platforms. From a marketer’s perspective those of us who have built audiences through our writing and speaking are attractive as a channel through which to promote their products and services. Theoretically our brilliant commentary influences others to action – possibly laughing at our brilliant comedy, making a change in their lives or perhaps even purchasing a product or service that we recommend. I do get paid to write and share content on my blog and social platforms on occasion. I am even being paid to share my thoughts on this conference by a PR agency. This post isn’t sponsored, I have written some content for them to share on their blog. In spite of periodically writing reviews and being paid for my content either with real money or with goods and services I have not considered myself an influencer. I am a blogger. I like to write and my blog is my space to write. Each piece I write is an opportunity to share my thoughts, try different writing styles, learn more about the topics I choose to write about and learn how to market the content that I produce. As a result of the conference I have shifted my thinking. I wrote this piece for Veritas Communications about the Canadian Dad influencer landscape prior to the conference. This is my pre-conference post for them and I have written a post-conference article as well. I have written and thought about social media quite a bit over the past six years. In my previous job I coordinated the writing of and edited a guide for physician recruiters on how to use social media as a recruitment tool. I have spoken at conferences on the same subject and write a regular column on social media for recruitment in the newsletter of the Canadian Association of Staff Physician Recruiters. I’m no longer in the physician recruitment field, but I still write and think about it. As a blogger I think about social media all the time. I look for opportunities to grow my audience and readership. I test out different social platforms to find out how they work and decide whether I will make use of them. Everyday I participate in conversations on Facebook and Twitter on topics of interest to me. In spite of all that thinking and use of social media, I have not until now thought of myself as an influencer. What makes me an influencer? In a word – PURPOSE. When I started writing on this blog it was as an outlet for writing. I like to write and I wanted to see how much content I had in me. I have at times in my life been a frequent writer of letters to the editor. In my more recent jobs I have been limited in what I could write to the editor about topics I knew something about because of my jobs. So I had a pent up need to comment on current affairs. Blogging was my safety valve. To be honest I also had an idea for starting an online consignment shop for kids’ toys and clothes and I thought maybe I could use a blog as a platform to start building a customer base of parents. That business idea faded as a motivation fairly quickly. My focus became more directed at writing about fatherhood and kids. As my girls grew I started feeling uncomfortable writing and sharing details and photos of their lives. This time last year I was struggling to find my purpose and how to keep writing without directly writing about my kids. This is an existential crisis that many parenting bloggers run into and wrestle with. I took a break from writing for a month, rebuilt my website and did some thinking about my blog and came out of it with a renewed focus. I still write about current affairs while wearing my dad hat. I write posts inspired by my kids that are not directly or as obviously about them. I also started writing my Dad Guide posts to provide tips and information for other dads that might be helpful to them in parenting. I feel that my purpose is getting more refined as I write this. I want to be an influencer. I want to be and encourage the change I want to see in the world. How can I make change? I try to make change in my house every day. My dad wasn’t around as much in my life as I would have liked and I want more for my kids. So I do my best to be engaged in their lives. Some days are better than others. I hope to make some change through my writing. I have written about my experience as a teen father and adoption because I want to challenge the stigma around teen pregnancy and encourage more guys to step up and accept responsibility for their actions and be a part of whatever decisions are made about the available options. I write about sexual health education because I am passionate about people having the information they need to make decisions about their own bodies. I have written about feminism and fatherhood because being a feminist makes me a better father. I have written Dad Guides on girls and their periods; guides for new dads on taking parental leave, changing diapers, supporting our partners; guides on teaching kids to ride bikes, talk with kids about death, set priorities, sing lullabies and more. Hopefully some of these have been helpful for other people. I want to do more. While I am certainly going to continue writing my Dad Guides and about current affairs and kids, I am also going to get more specific in my focus on two main areas that I want to see change and where I think change is needed. More and more men are taking on the role of engaged dads. According to Baby Center, Millennial Dads are stepping up to the plate as dads involved in their kids lives. My generation – Generation X is more involved than our fathers’ generation, but there is still more we can do. The desire is there to be involved and yet men face barriers in workplace policies and activities available to us. In the US, parental leave for mothers or fathers is hard to come by and while President Trump (and Ivanka) propose to create maternity leave for mothers, it is important to also create the opportunity for dads to take leave as well. This excellent article in The Hill makes the case for the need for dads to be included in US policy. In Canada, we have 52 weeks of parental leave, 35 of which can be shared between parents. This is great, however many dads don’t take leave. This is either because their workplace doesn’t provide a top-up to the program funding making it unaffordable to take leave or they, like mothers take a hit to their careers for taking leave. In many workplaces and industries it is still assumed that the mother will take care of the child and as such the father is looked at as less of a man for taking on prioritizing family over work. I want to change this. I am not sure yet of my approach, but I am going to start working on advocating for change to these systemic barriers. J0sh Levs, author of All In is doing a great job challenging the notions that men aren’t competent parents and the mythologies about men doing less work. I see this incompetent parent idea repeated over and over again in media articles, TV shows and commercials. I want to work to challenge these barriers myths. I want to help change the perception of dads and the definition of masculinity. I recognize these are big goals, but I have spare time so I figure why not work to change gender norms and myths. I have no idea how I will accomplish these objectives. I made some good connections at the Dad 2.0 conference that will help me figure out the next steps. So I am going to be an influencer and work to make change on these two issues. I am going to use my platform to do some good. Blogs are definitely a great outlet (I know mine has certainly been over the years!) and also gets people thinking and talking about issues, challenging misconceptions and mistruths, etc. This is how change happens, right? So keep doing what you’re doing! such great pause for thought. are we all influencers? “we need to change perceptions and I’m going to do my part” yes! I find your blog fantastic and informative and I am NOT a parent, nor do I intend to be one but I have young people in my life who need my support and I will be there for them!